You will earn 1,980 Reward Points. Earn 1 reward point for every 1 dollar spent. 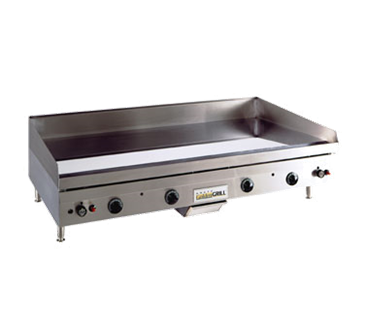 Reliable Even-Cooking Griddle Provides Outstanding Performance for Breakfast, Lunch or Dinner Menu Items. This series of griddles features exclusive plate temperature sensors which respond to temperature fluctuations quickly. Individual thermostatically controlled burners every 12 inches (30.5 mm) maintain consistent temperatures under heavy load conditions. Precise thermostats allow separate heat zones for different products. Cook foods to golden perfection with Anets GoldenGrill Gas Griddle.